Guitar I is an introductory course to the basics of classical guitar playing (fingerpicking style). In the first semester, students learn basic music theory and are taught to navigate the instrument through the learning of easy melodies and two-voice harmonized parts. The third quarter of Guitar I stresses chord shapes and strumming techniques to facilitate the learning of an accompanying style of guitar playing (jazz/blues “comping” and rock/folk “rhythm guitar”). In the fourth quarter, students work on solo and duet pieces for their end-of-year recital. Classical style is revisited and certain advanced techniques are covered. Once a week throughout the school year, a brief "Guitar History" lesson is given, where students learn the origins of modern music genres and study history's great classical, jazz, and rock musicians. 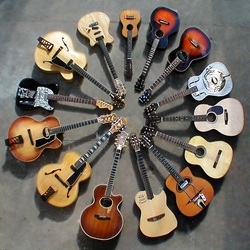 Guitar II is an intermediate guitar course and picks up right where Guitar I leaves off. Because it is held during the same period as Guitar I, this class relies upon the maturity and motivation of its students to learn the new material on their own and rehearse in small groups. Contemporary techniques and soloing styles will be covered, as will more advanced music theory, jazz chords, and music composition. Students will work on analyzing, transcribing, and performing prerecorded solos, and guest artists will be brought in to hold master classes.